The Wattle Woods now has a forever-flowing little wriggling stream. 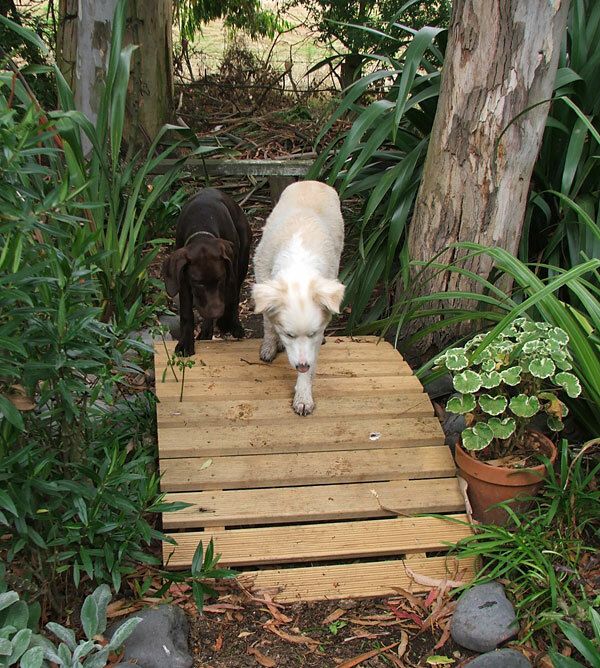 Non-Gardening Partner has built me two little curved footbridges for easy crossing from side to side. Can bridges be beautiful? Oh, yes - these two certainly are! OK, I could have leapt over the stream, which is half a metre wide at most from stone edge to stone edge. But not holding an armful of rakes and shovels, and certainly not with the wheelbarrow. Mountain bikers might stride manfully over obstacles with their cycle high above their head. But lady-gardeners hoisting up their wheelbarrows? No way. So, oddly, this is the biggest joy about the footbridges - I can wheel a full barrow load of rubbish, long handled tools balancing on top, up and over, in either direction, without anything dropping off. The slope is gentle enough not to pose a problem, either. 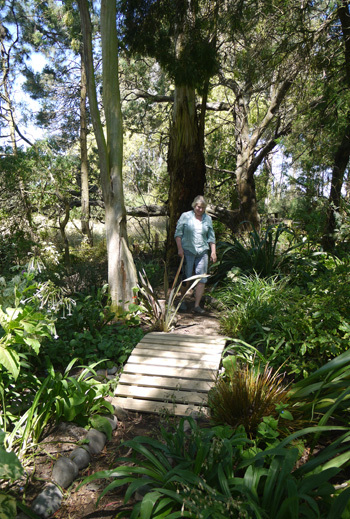 In fact the design and the size fits the scale of the Wattle Woods perfectly. 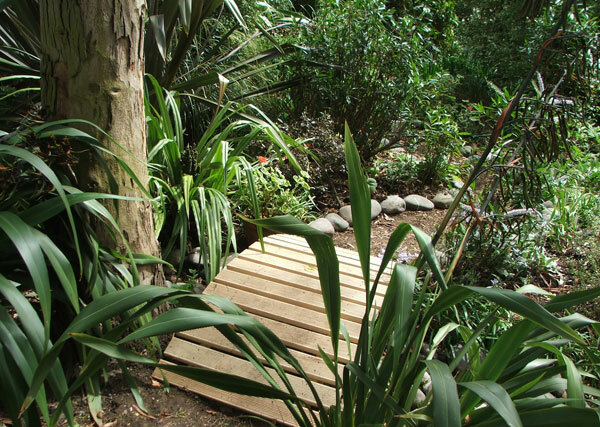 They are full of foliage plants - Agapanthus, Phormiums, and Hebes - which set off the wood rather nicely. As usual Non-Gardening Partner's standard of workmanship is sublime. And these two little bridges were delivered in record time. The only drawback was a bit of wastage from the timber (a problem with the curves, which were cut out of solid pieces of wood). Consumer Tested By An Old Lady!